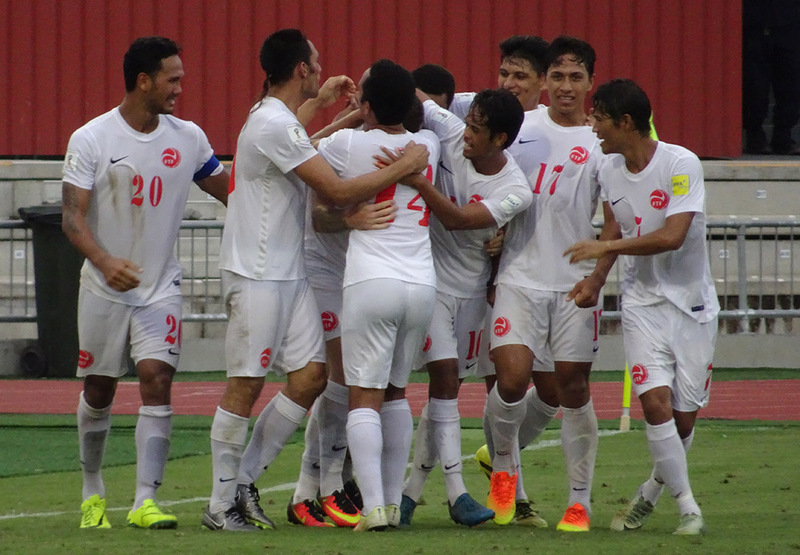 Tahiti celebrate Sylvain Graglia's second goal. Credit: OFC Media. Tahiti moved three points clear at the top of Group B in OFC Stage 3 of 2018 FIFA World Cup RussiaTM Qualifying with a vital 3-1 away win over 10-man Papua New Guinea in Port Moresby on Thursday night. A second half double from striker Sylvain Graglia led the fight-back that was iced with an injury time third from Teaonui Tehau. Despite losing starlet David Browne to a red card in the 22nd minute for an elbow to the face of Taumihau Tiatia, the hosts took the lead when Nigel Dabinyaba looped a deft header over Mikaël Roche as the first half ticked to a close. Papua New Guinea continued to give as good as they received throughout the second half but Tahiti’s advantage in playing numbers eventually told just before the hour mark was reached as Graglia converted a Tehau cross to draw the sides level. Graglia then added a dazzling second in the 85th minute blasting the ball into the top corner after a weaving solo run. Tehau’s volley in the third minute of time added on confirmed the Toa Aito at the top of Group B with six points, three points clear ahead of Solomon Islands, as they head to Papeete for Tuesday’s return fixture against Papua New Guinea. The winner of each of the two groups meet in a home and away OFC Stage 3 final in September. “It was important for us to win today because with victory winning today we will offer the people back home in Tahiti an important match,” said Tahiti coach Ludovic Graugnard. Graugnard said he was confident his side would overturn the deficit but admitted to delivering a broadside across the bow of his players at halftime who he felt hadn’t settled after Browne’s dismissal. “The red card I guess was good for us. It was a very good player who plays professionally in Netherlands, so it was a loss for them. Papua New Guinea coach Flemming Serritslev was proud of they way his side were able to shake off the shock of the red card and get themselves in front but conceded Tahiti were too good in the end. “I’m satisfied we were able to bring it to 1-0 and I can’t blame the players. They fought the best they could. I think Tahiti found where we were most vulnerable and capitalised on it. I have to congratulate on their win. It was deserved. Six points behind Tahiti now but with two games in hand, the pressure goes on Papua New Guinea to claim all three points in Papeete. OFC Stage 3 continues on Saturday when Fiji host Group A leaders New Zealand before both ties are reversed with games in Wellington and Papeete on March 28.